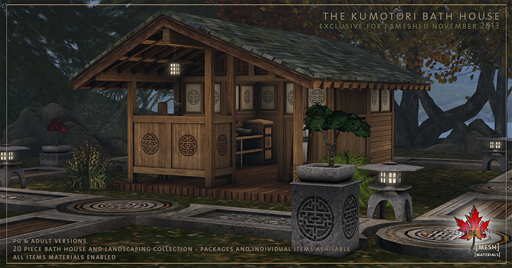 Before autumn slips into winter, take one last relaxing day in the mountains with Trompe Loeil’s new Kumotori Bath House at FaMESHed! 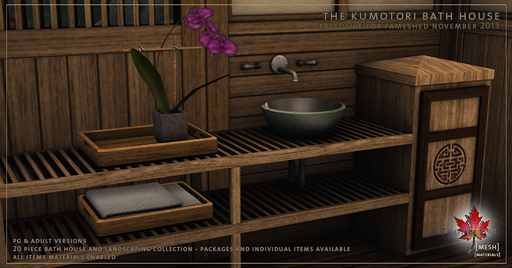 This wood and stone collection comes in PG or Adult maturities and features everything you need to create a tranquil spa experience – bathtub, shower, sink, accessories, and landscaping! 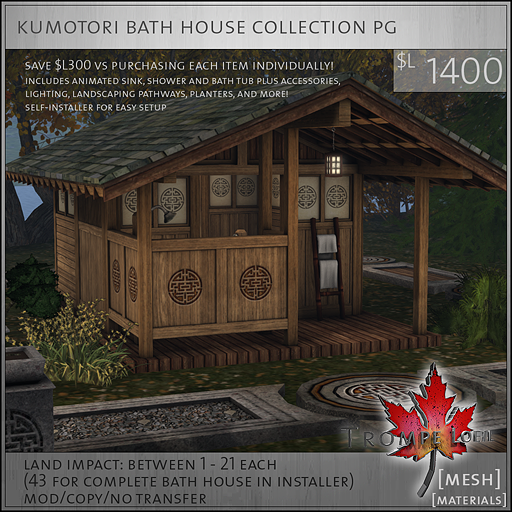 The Kumotori full packages include everything – a self-installer with the Bath House and accessories completely set up and ready to use, individual separates of the bath and bath house and all accessories, plus the landscaping items. 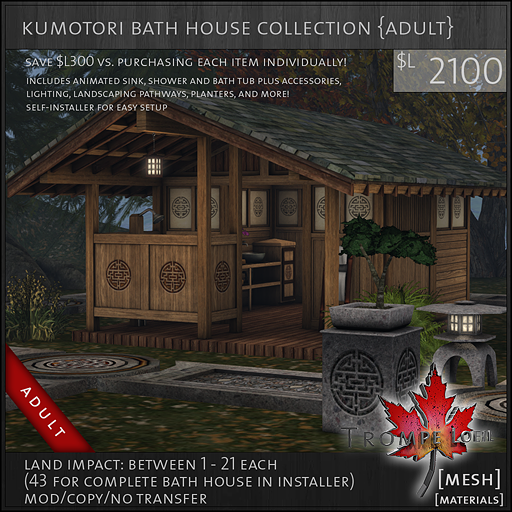 You’ll save $L300 vs. purchasing each item separately! 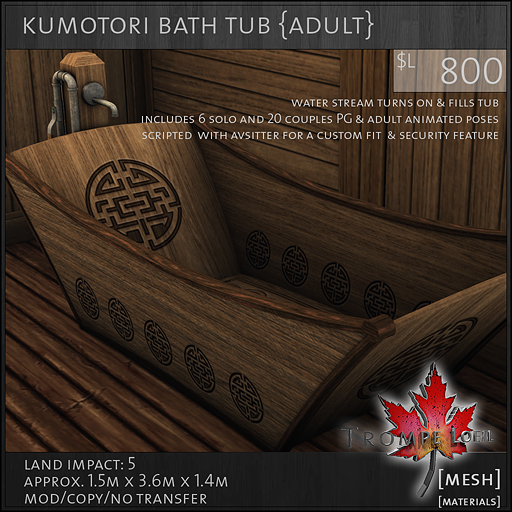 Adult version bath includes 6 single and 20 couples poses, Adult version shower includes 3 single, 9 PG couples and 10 Adult couples animations; PG version bath includes 5 single and 1 couples pose, and PG version shower includes 3 single and 9 PG couples animations. 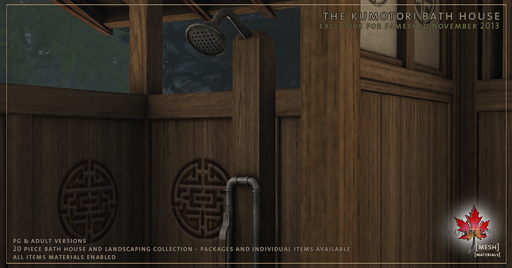 The shower, bath and sink feature working moving handles and water particle and sound effects. 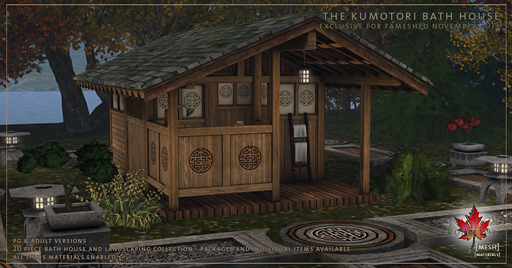 The Bath House door opens and closes on touch, while the hanging lanterns turn on and off on touch and add a warm glow inside and out. 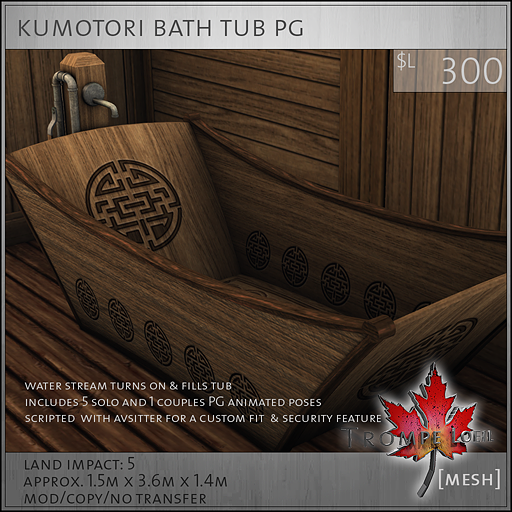 The Kumotori Bath Tub is also available separately! 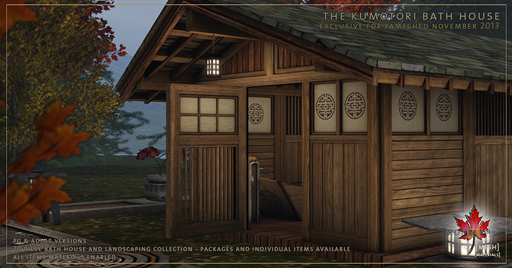 The Accessories pack and the Landscaping pack are both included with the full Collection packs above; or, purchase them individually to go in your existing builds. 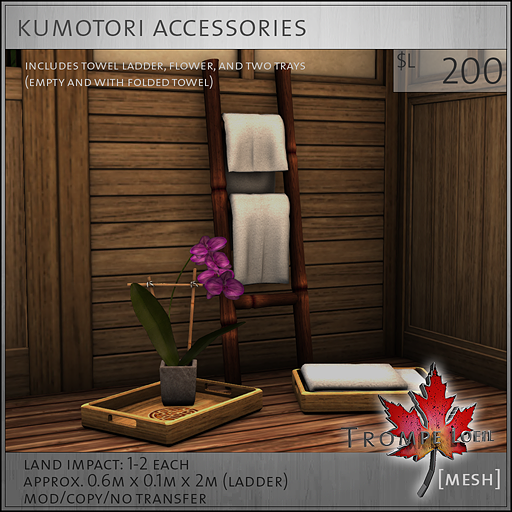 The Accessories pack includes the ladder towel rack, two trays (empty and with towel) and the flower arrangement. 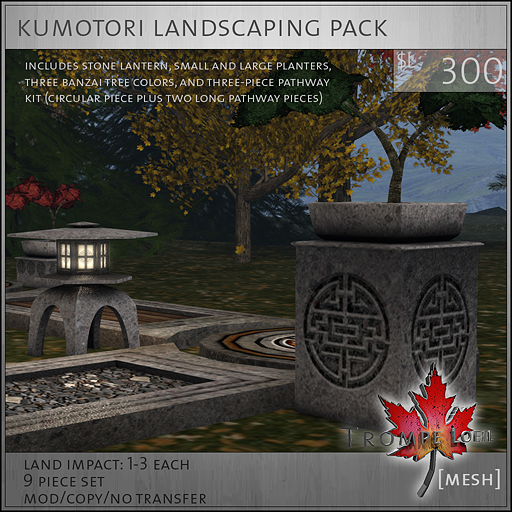 The Landscaping pack includes three walkway segments (central circle and two 5m pathway sections designed to fit around the circle), two planters (tall and short), three banzai trees (green, pink and orange) and a stone pathway lantern (always on, unscripted for large-scale use). 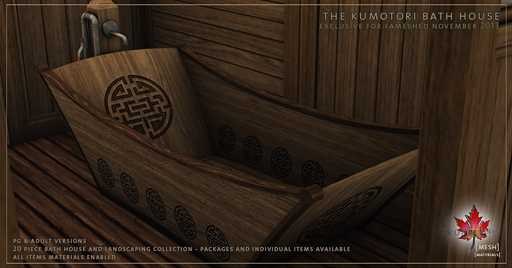 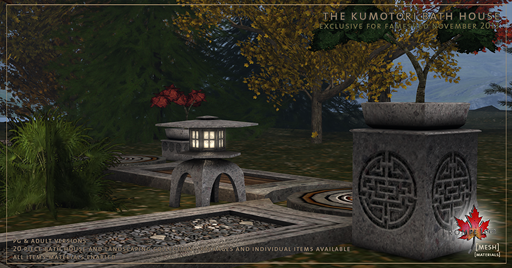 The entire Kumotori Collection is on display and available only at FaMESHed for the month of November – stop on by!